Advocates won some hard-fought battles for safer bike infrastructure this year, and on Sunday they celebrated with a ride on Manhattan’s newest protected bike lanes, starting at the foot of the Manhattan Bridge and ending at Amsterdam Avenue and West 105th Street, thanking supporters along the way. Manhattan Borough President Gale Brewer, Council Member Margaret Chin, Assembly Member Deborah Glick, and State Senator Brad Hoylman all joined for parts of the ride, which traversed new protected lanes on Chrystie Street, Sixth Avenue, and Amsterdam Avenue. 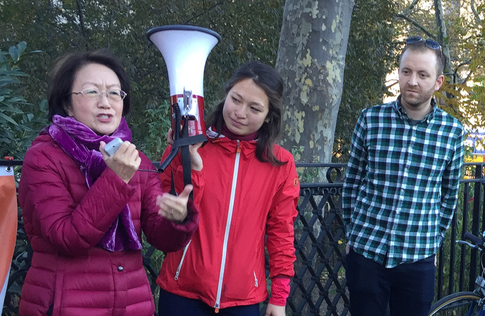 “We want to make sure people are safe — pedestrians and bikers — and if the city can do something to make that happen, we must do that,” Council Member Margaret Chin told riders at the foot of the Manhattan Bridge. Chin supported the Chrystie Street two-way parking-protected bike lane in her district, which DOT is in the process of installing between Canal Street and Houston Street. Of the three projects, the Chrystie Street redesign (which is still in progress), came together the quickest, after activists first proposed it in late 2014. By comparision, the Transportation Alternatives Manhattan Committee began pressing DOT and local community boards for a Sixth Avenue protected lane over three years ago, said committee chair Janet Liff. And a protected bike lane on Amsterdam Avenue was first proposed at Manhattan CB 7 in 2009. After hearing from Chin, the group met at 14th Street and Sixth Avenue with Assembly Member Deborah Glick and State Senator Brad Hoylman, before heading uptown to meet with Manhattan Borough President Gale Brewer. A PBL on Fifth to 34th would be a perfect complement to the Sixth Ave PBL. Is Chrystie Street fully in? Went past a week ago and it wasn’t. It wasn’t fully in during the ride on Sunday. There were spraypainted markouts but the thermoplast is not yet installed, so cars are still parked along the curb. Getting close. As of last night, the signs and new signals are in, along with almost all of the car lane markings and bike lane buffer. Still need the bike lane itself to be painted. Thanks! I don’t want to miss the first true “opening day”. I got some great before footage to contrast it with. My elderly relatives, who never ride a bicycle, love the new Amsterdam Avenue. It has calmed the cars a bit, made motorists take left turns slower, and shortened the avenue’s crossing distance. What a home run for safety in NYC! The problem is many bikers ignore the rules of the road like stopping at lights and stop signs, yielding to pedestrians, using proper hand signals, etc. so we now need bike lanes but these lanes just make many bikers more brash. Do motorists become more brash when they are given 3+ lanes despite their speeding, speeding through red lights (“catching the light”), texting, failing to yield to pedestrians, making illegal u-turns, blocking ambulaces, failing to signal, honking illegally (even late at night on residential streets), illegally idling engines, illegally double parking, block crosswalks at red lights, shall I go on? The two-way protected bike lane on Chrystie Street is one of the most anticipated bike network improvements of the year, creating a much safer connection to and from the Manhattan side of the Manhattan Bridge. Today, DOT officials and State Senator Dan Squadron joined advocated for an inaugural ride on the redesigned street.